Josh Lewenberg @JLew1050 42m Orlando reporter asks Nurse if Pascal Siakam has become the Raptors' 3rd option. "If he has he's dropped down from being the 2nd option." 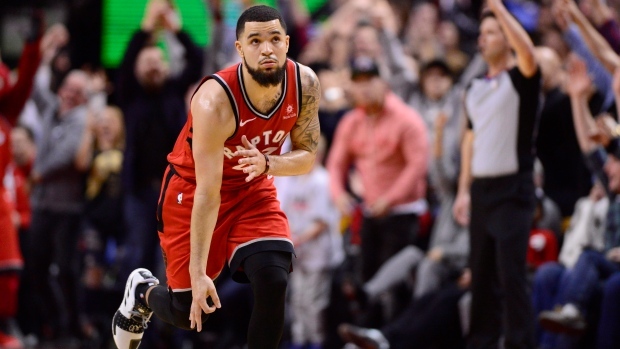 Fred VanVleet will make his return to the lineup when the Toronto Raptors visit the Detroit Pistons on Sunday. VanVleet's status was upgraded by the Raptors from questionable to probable and he will participate on a minutes restiction according to Postmedia's Ryan Wolstat. Lowry is out vs DET today but VanVleet returns on a min restriction, per @WolstatSun. Sounds like Kawhi will play. This is the 1st half of the Raptors 12th and final b2b of the season and he's sat out at least 1 game in each, so safe to assume tomorrow is load management night. The point guard has been out of action since Feb. 9 with a thumb ligament injury. VanVleet has averaged 10.5 points per game this season. The Raptors will be without Kyle Lowry, who will miss his second-consecutive game with an ankle injury.